Dorothy Vos-Voelker went home to be with the Lord on February 8, 2019. Visitation will be 5 until 7pm Monday, February 11, 2019 at Adams Funeral Home, 502 Douglas Ave. Funeral Services will be 10:00 a.m. Tuesday, February 12, at Bethesda Lutheran Church. Burial will be in the Alexander Cemetery. Dorothy was born January 20, 1923 in Alexander, Iowa, to Jacob and Carrie (Gruis) Ostendorf. She graduated from Meservey High School in 1940, received her teaching certificate in 1942 from Central College where she met her first husband. She taught in Gilman, Iowa and Hudsonville, Michigan schools before she married James Vos, in August 24, 1944 in Meservey, Iowa. 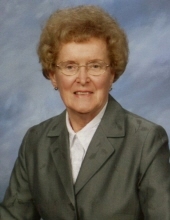 Dorothy served alongside her husband as the pastor’s wife and organist for nearly 40 years in Faith Reformed Church in Grand Rapids, MI, Central Reformed Church in Muskegon MI, First Reformed Church in Sheboygan Falls, WI, Ebenezer Reformed Church in Leighton, IA, and Trinity Reformed Church in Sibley IA. Jim died in 1982. In 1986, she married Don Voelker in Ames. In retirement they traveled and enjoyed spending time with their families. Dorothy was a loving wife, Pastors wife, organist, teacher, mother, grandmother, great-grandmother. She was Miss Meservey in 1939 as a teenager. Dorothy and Jim served on mission trips with Winnebago Indians in Nebraska. We will fondly remember her ability to find a thread of connection with nearly everyone she met. Relationships are the only thing we can take to heaven with us. Our home was often filled with music from piano, organ, and singing. She is survived by her children: Philip Vos (Christine) of Cedar Rapids, IA; Daniel Vos (Sherrie) of Ames, IA; David Vos (Carol) of Melbourne Beach, FL; grandchildren Melissa (Anthony) Henderson, Steve Vos, Nathan (Lisa) Vos, Eric (Kaitlyn) Vos, Andrea (Vincent) Vos-Rochefort, Josh Vos, Chris (Rebekah) Vos, Stephanie (Jared) Fonvielle; and 11 greatgrandchildren with another great-grandchild due in March. She was preceded in death by her brother Luverne Ostendorf, parents Jacob and Carrie (Gruis) Ostendorf, first husband James Vos, sister Irene Stadtlander, sister Alvina Dorenkamp, and her second husband Don Voelker. To send flowers or a remembrance gift to the family of Dorothy F Vos-Voelker, please visit our Tribute Store. "Email Address" would like to share the life celebration of Dorothy F Vos-Voelker. Click on the "link" to go to share a favorite memory or leave a condolence message for the family.